Almost two years ago now, I wrote a post on the difficulty of finding running gear for tall women and gave some suggestions based on my own purchases. (To read my original post, click here!). That post has become of the most popular articles on Technically Running, and it has been so fun to hear from my fellow tall ladies and know that I’m able to help them out! Of course, finding tall running clothes continues to be challenging, but I’ve still managed to grow my own running wardrobe over the past two years, so I wanted to take the time to share more running gear for tall women. Enjoy and happy running! 1. Brooks Running Finding “regular” running shorts (i.e., the loose kind–not compression shorts) is particularly tricky as a tall woman. Most of the options out there come with 2-3″ inseams, which basically amounts to underwear if you’re 6’1″ (and, in my case, lots of thigh chafing). Brooks Running offers running shorts for women with 5-7″ inseams, and they have done a great job ensuring that longer doesn’t mean unstylish or frumpy. I just picked up a pair of the Sherpa 6″ shorts and am already in love after only a couple runs in them. They are loose and comfortable around my legs, and long enough that they don’t ride up or allow my thighs to rub together. The only complaint I have is that the waist is a bit lower cut than I typically buy, but it does have a drawstring and seems to stay in place fairly well. Brooks also offers compression shorts with a long inseam (Infiniti 7″ Short Tight). 2. Oiselle I absolutely love Oiselle running clothes, so I was thrilled to discover that they are a tall-friendly company. Although they do not have tall/long sizes, I have a pair of their running tights, and they are long enough on me (I have a 36″ inseam) and super cute! The pair I have are no longer available, but they are very similar to the Go Jogging legging. I also have a cotton long-sleeve shirt from them and the sleeves and torso are cut very long. 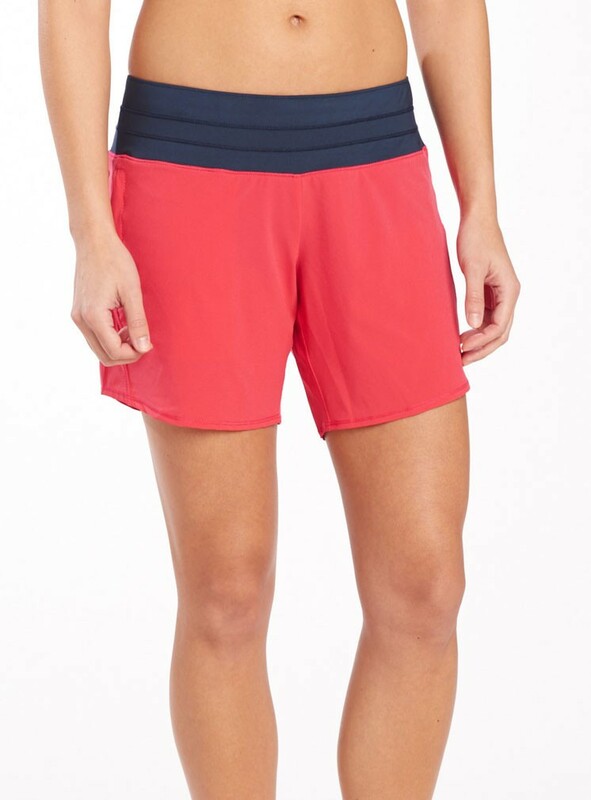 Oiselle also offers a long version of their Roga short, which has a 6″ inch inseam that would be great for long legs. Finally, can we talk about how adorable the Runaway Bride dress is and how much I wish they’d offered it when I got married? Would it be weird if I bought it anyway? 3. Fabletics For those of you who are more budget-conscious, Fabletics is a wonderful option for workout clothes for tall women. I was really skeptical when I heard it was workout gear by Kate Hudson, but the quality of the clothing they offer is quite good and you can get an entire outfit for the same amount of money as (or less than) a single item at many other places. They offer tall sizes in leggings, and although they don’t come in special sizes, reviewers note that the sleeves on the tops run quite long. Buying clothes from them does require that you sign up for a monthly “subscription.” Don’t worry, though, you don’t have to pay anything unless you want to. After you sign up as a VIP, you just have to remember to go to the website before the 5th of every month (there will be an email reminder) where you can choose to “Skip this Month” and thus not pay. If you don’t skip, then you will be charged $50, which you can put towards an outfit or clothing item. Your first outfit after you subscribe is half-off–I got capri leggings, a tank top, and a sports bra for $25! The only downside is that the company is very popular right now, so a lot of the colorways/sizes are currently listed as out of stock. Shameless plug: If you subscribe using my invite link, I’ll get referral points! 4. Old Navy I haven’t personally tried Old Navy athletic gear, but it comes highly recommended from a tall reader of the blog, and is another option for those of you wanting to stay on the cheaper side. They offer compression shorts with an 8″ inseam and running tights in tall sizes. I’m particularly intrigued by the Active High-Rise Compression Pants, as I tend to like higher rises on my pants. Bonus Round: The RunOutlet website allows you to filter your search results for shorts by inseam, so you can view only shorts that have 5-7″ inseams (or even longer!). This can help you find additional brands that offer longer lengths, but also gives you the opportunity to get items you like on sale! The current selection includes shorts from Moving Comfort, Pearl Izumi, and New Balance. I haven’t tried the shorts from these companies, but I have other running/fitness gear that I love from each of them, so I would expect the shorts to be of good quality. As for RunOutlet, I’ve never bought anything from them, but I have made purchases at their sister site, SwimOutlet, and found it to be a trustworthy website.